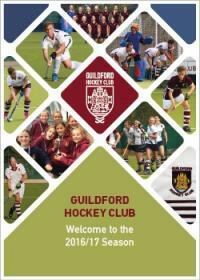 Welcome to Guildford Hockey Club where players, parents and supporters have been enjoying the sport and social life that thrives around hockey since 1912. 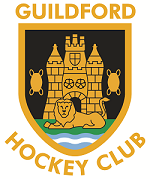 As the the game of hockey has evolved, so has Guildford to comprise 6 Men’s teams, 4 Ladies’ teams and a thriving Junior Section encompassing more than 500 children from the ages of 6 to 18 years old. We are situated at Broadwater School in Godalming with two all-weather pitches and a Clubhouse that is brimming with activity on weekday evenings and on weekends during the season when we are training, playing matches and running social events. We pride ourselves on providing an enjoyable and productive hockey experience for all age groups and all ability levels. Please have a look at our website and if you are interested in playing or getting involved. We welcome new players. Come and see why Guildford is A Great Place to Play. Thank you to all who completed the survey about new kit. The kit committee has reviewed the current kit, our club requirements, what is available in the market, various supplier and retailer options and has made a decision. We are entering a new four year kit cycle. See the details here in Club News. Many, many thanks to Anthony Greenhalgh for spearheading the effort to make sure that the best decision possible was made. See our new Club Kit Shop to order your kit ahead of the new season from new supplier Hawkinsport. Pre-Season hockey training for Ladies 1s, 2s, Juniors by invitation begins Wednesday 10th August. Meet at 7.30pm, finish 9.30pm. First team coach Alice Lane started at GHC ahead of the 2015/16 Season, having come to us with 10 years of National League playing experience at a range of large clubs around the country (St Albans, Bristol Firebrands and most notably Reading where she was Captain of their National League side for nearly 5 years including leading them into the Premier League). This experience, she says, has provided her with a good insight into the workings of successful clubs. 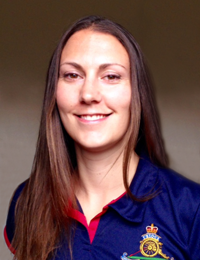 With ten years of coaching experience, Alice has worked with a variety of Junior and Adult squads over the years. Alice completed her England Hockey Level 3 coaching certificate whilst coaching the University of Portsmouth Ladies 1st XI. She has experience coaching in the Single System, including at JRPC level, in addition to her Club, School and Uni experience. Alice has been a really positive addition to GHC, a terrific role model for the girls and ladies. She is looking forward to the 2016/17 season with plans well underway. Contact Alice for more information. Please see our exciting list of sessions and courses available for Goalkeepers looking for extra coaching during the summer and in the new season (note this is outside of regular weekly sessions taking place during the season when it starts). Thank you to all who supported our AGM 2016. Some great discussion and support and three new Board members! Well done to all who came and participated. See the minutes here. More details for the new season will be forthcoming. Well done to the girls for coming fourth in England against tough competition! 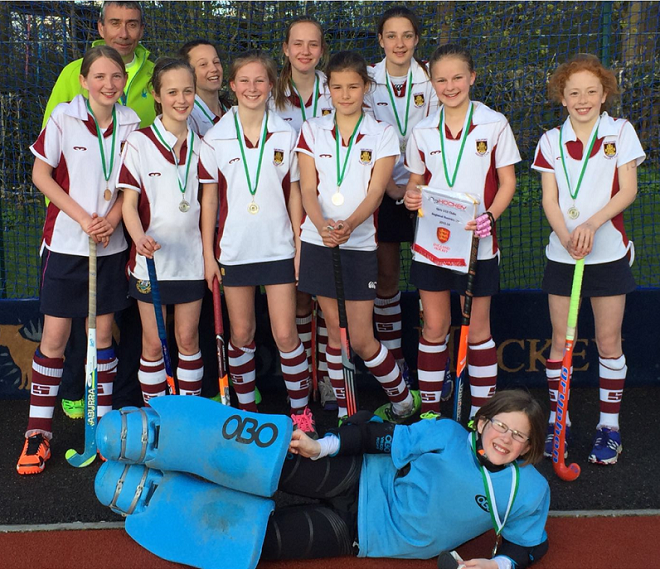 Having come top two in the Surrey County Cup, the Under 12 Girls had their place in the South Cup, the top two teams of which would progress to National Finals. We won all three of our group matches without conceding a goal. A very comfortable opening 3-0 win over Buckingham was followed by a rather more nervy 1-0 win over Epsom, whose keeper made two or three outstanding saves to keep them in it for a long period. We finished off with a 3-0 win over Wallingford. In the quarter final we managed to give ourselves a scare letting Sunbury get in behind to take the lead, but after a nervy 5 minutes we ran out fairly comfortable 3-1 winners. Reading in the semis were, not surprisingly, the best team we played up to that point, but the squad rallied after Siena’s injury to win 2-0 and progress to yet another tournament final against Surbiton. A few injuries left us a bit light of the task against Surbiton, who ran out deserved 3-0 winners in the final, but we live to fight another day and could easily find ourselves toe-to-toe with them again in a month. Across the day they played like we all know they can and thoroughly deserve their chance in the Nationals. Best of luck at Beeston on Saturday, 14th May!! 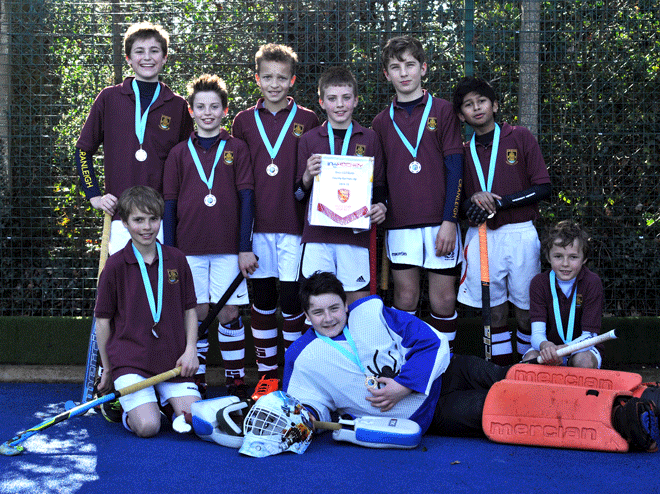 The EH Club Championships began in October with about 80 teams competing for a place in the Regional Play-offs. 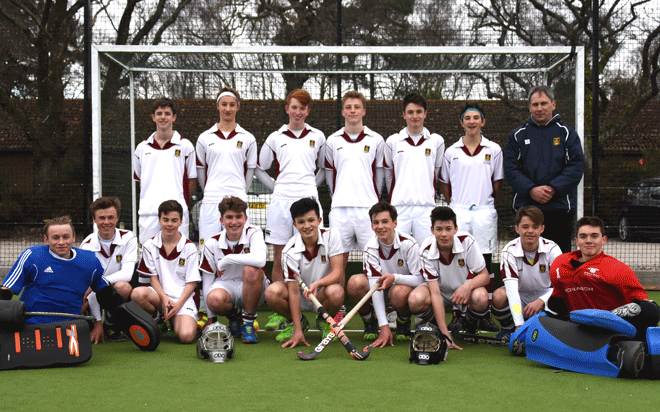 GHC Under 16 Boys won their Local pool to progress to the Regional event that took place in February. Coming first in the Regional event gave them a place in the final eight teams competing over two days at the Home of England Hockey, the Lee Valley Hockey & Tennis Centre in the Olympic Park. The competition in their Pool was extremely tight. Two draws and a win got the boys a place in the 3rd/4th play-off where they were 2-0 up but then unfortunately let the lead slip. It was all very close and at one point the boys were poised for a place in the final until fortunes changed in the closing seconds of the middle Pool B matches. The boys had a draw against the second placed team and there was only one goal between them and the bronze medal. Unbelievably tight and a great effort to come 4th in the country. Well done to Coach Toby Mullins and Captain Josh Powell, to the team who played on the day and indeed to the entire Under 16 Boys Squad who have worked hard all season! 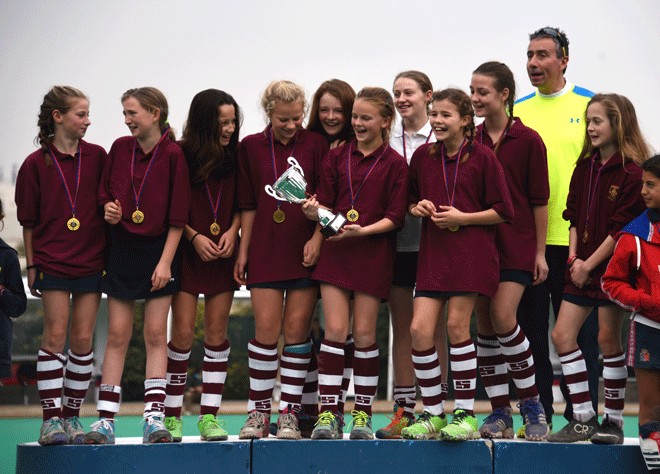 GHC hosted the Surrey County Cup competitions on Sunday 20 March. All teams did well - two teams in the boys' competition and three in the girls' competition. Both Girls and Boys A teams have qualified for the South Region Finals taking place on 17 April at Merchant Taylor's School. Superb job everyone! GHC proved terrific hosts once again and once again thanks to Dave Hall and his team for catering. 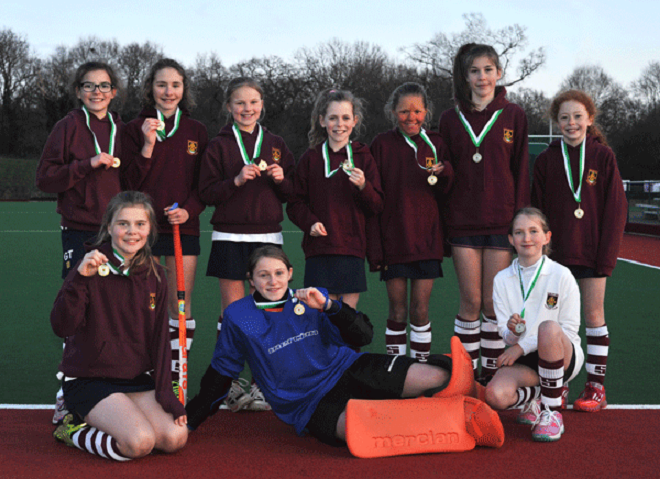 The Under 12 Girls competed in the Surrey County Plate Competition on 13 March and came out winners. See the match report here. 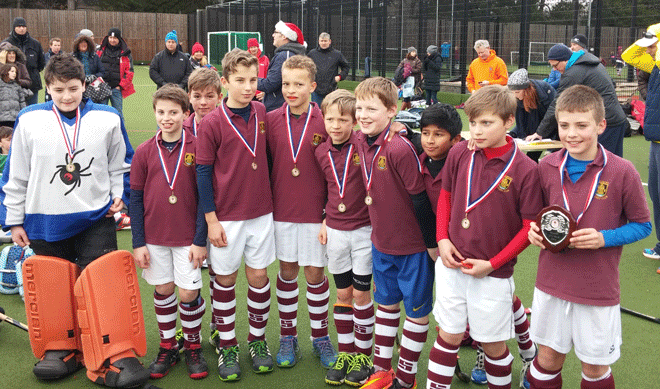 Our Under 10 Boys won bronze in their Surrey Cup Competition in the end of February and the Under 10 Girls finished with bronze in both their Surrey Cup and Plate competitions. Each tournament included more than thirty teams from one of the most densely populated hockey playing counties in the country. Well done to all involved. 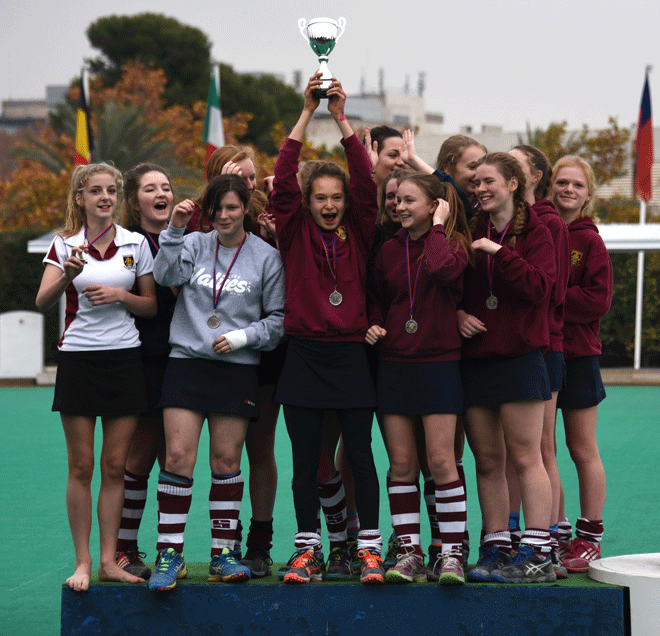 England Hockey run national competitions in the U12, 14, 16 and 18 age groups. The Under 14 and 16 competitions start with a Local regional pool of five teams ('Tier 1') with matches running from October to February. The top two teams in Tier 1 go on to a Regional pool of four teams in 'Tier 2.' The winner of Tier 2 goes on to the National Finals ('Tier 3'). Our Boys won all of their Tier 1 matches earning 12 points in the pool and with a goal difference of 19. 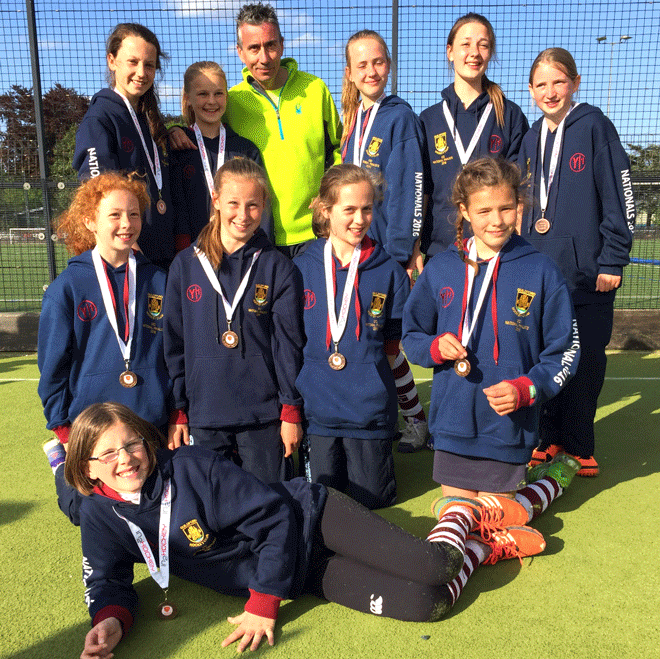 They travelled to Bournemouth to compete in the Tier 2 competition where two wins and a draw secured the top sport in the tournament. The Boys will be playing in the National Finals in early April which includes the top 8 teams from across the country. The venue is likely to be the Lee Valley National Hockey & Tennis Centre. Check back for details and come to support! Injuries do happen and we need to be able to recognise when there may be a serious head injury that requires time off for recuperation. EH & GB Hockey have published a very detailed policy to help guide clubs on what to do in case of head injuries. There is a short summary and a 14 page documents which includes useful tips like how to diagnose a concussion and what the rest requirements are for different age groups. The advice has been added in our Club Info area. Please have a look: EH & GB Concussion Policy. What a weekend! 66 Players and 50 parents and coaches travelled to Barcelona on Friday 4th December for the 19th annual Torneo de la Inmaculada hosted by the esteemed Real Club de Polo de Barcelona. With 82 teams and nearly 1000 players participating, including top teams from across Spain and Europe, this is one of Europe's largest and most competitive youth tournaments. This is the first year we were able to take three boys' teams and three girls' teams. Over three days, each team played five matches in a given format for their age group. All teams started with a pool stage; some progessed to further pools and some to play-offs and finals. It was a full weekend of hockey for our Guildford supporters, all of whom watched every Guildford match that didn't clash with another one. The support was amazing and thanks to all who came along! See a summary of the results and a gallery of photos here on the Junior page. New or returning players always welcome! Please look at our Juniors, Men's and Ladies' pages by clicking on the buttons at the top of the page. Click here to see our Training Schedule 2015/16. We would love to hear from you and see you at the Club soon! 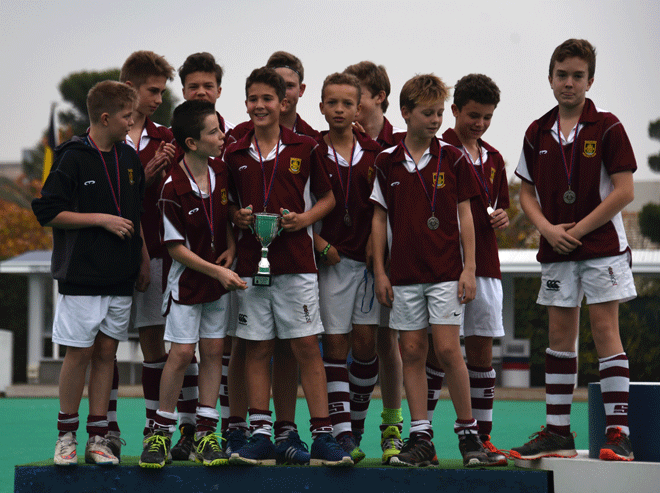 Unbeaten in the first two stages of the England Hockey Boys U14 Championships with a +60 goal difference, Guildford Under 14 Boys took to the pitches at the Queen Elizabeth Olympic Park on Saturday 9th May for the England Hockey National Finals. More than 80 teams started the competition back in October and it was down to the top eight to see who would triumph. GHC boys missed out by the narrowest of margins on a chance in the final but overcame any penalty shoot-out nerves to claim the bronze medals in a field of competition that was very tough. Beeston were deserving winners and it was a great day out for GHC players, parents, coaches and supporters. Read about the event and see photos in the tour report here. GHC hosted the Mercian Finals Day on Sunday 3rd May. The Mercian Home Counties Colts Hockey League comprises more than 140 teams across the Under 14, 16 and 18 boys' age groups. Finals Day brings together the top four teams in each age group. 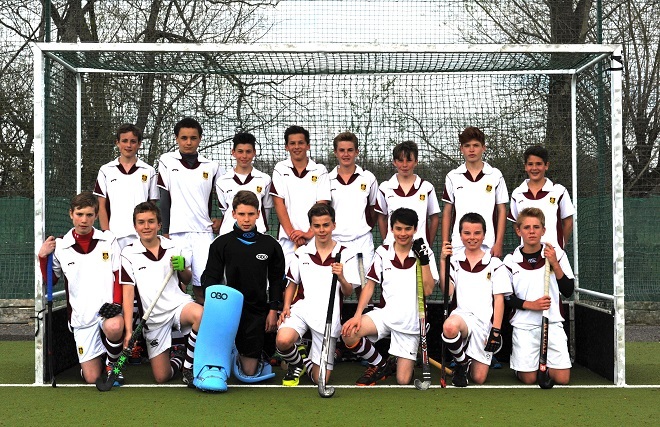 Guildford Under 14 Boys won their play-off to get into the Final v Surbiton which was drawn at full time. Golden goal went against them in a match that could have gone either way. Max Greenhalgh was awarded the man of the tournament trophy by FIH President Leandro Negre who came straight from Heathrow to GHC and then back to Heathrow via the Hockey Museum in Woking. 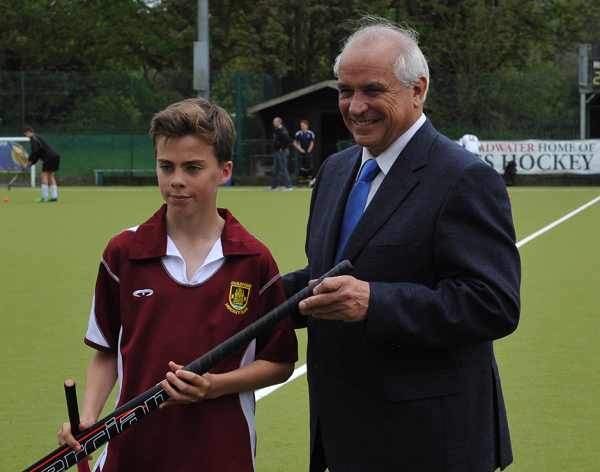 Max was presented with a new Mercian stick courtesy of Simon Mason and Mercian Sports. Men's 2nd XI Win League Cup! 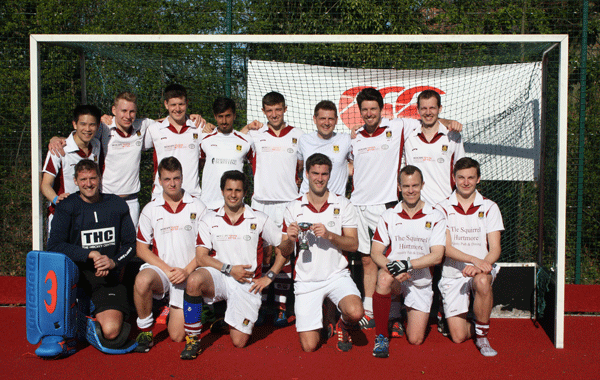 Well done to the Men's 2s who on Saturday 18 April won the Higgins Group London Hockey League Divison 2 Cup! 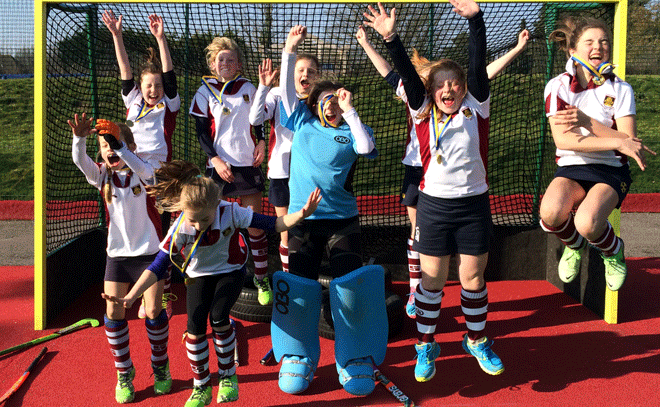 Well done to the GU10s! 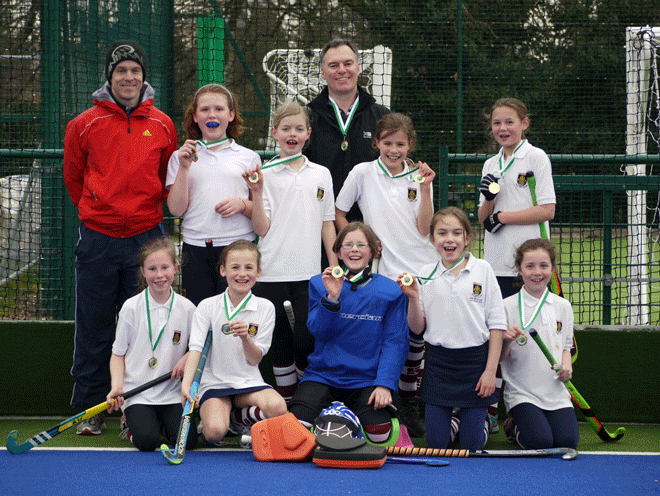 After a massive effort over 75 gruelling minutes of hockey, the GU10s took away gold medals as Surrey Champions. A great performance by all, and reward for the many hours of training and matches throughout the season. 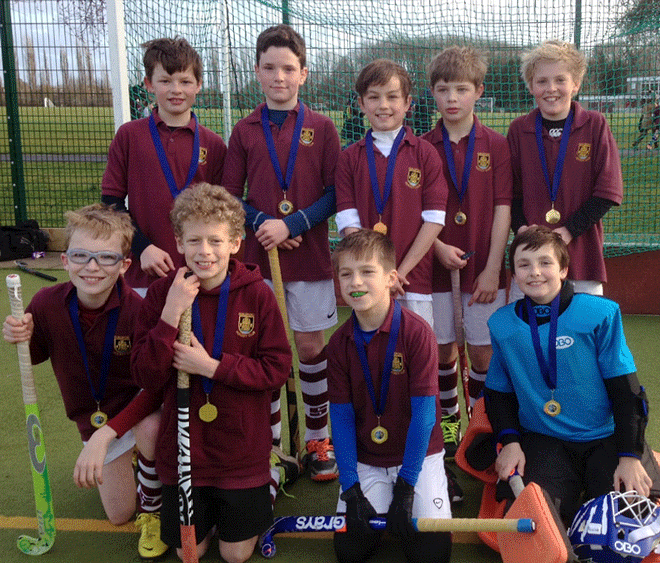 GHC Under 12 Boys teams came 2nd and 4th in the Surrey Cup held on 1st March. 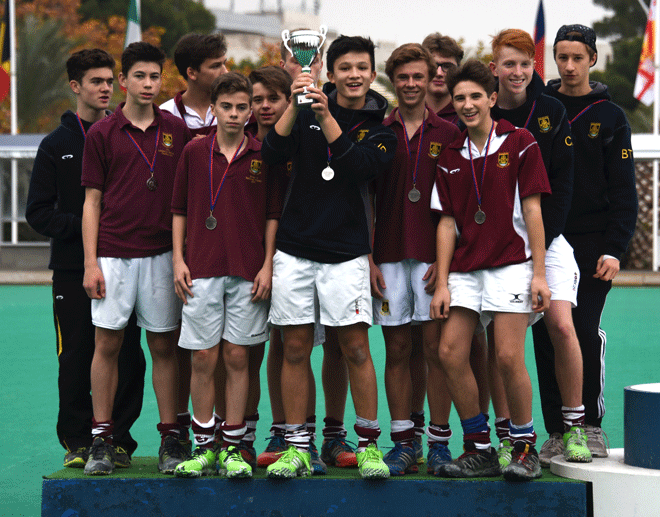 The two teams met each other in the semi-finals and the winning team went on to draw with Surbiton in the final only to come 2nd on penalty flicks for the decider. One of the tournaments we look forward to each year in the Junior calendar is the Teddington Xmas Invitational. This tournament, held the Sunday before Christmas, includes top teams from across the South region of the country. Not only an excuse to avoid shopping, the Under 10 and 12 boys and girls have a great time and play some really competitive hockey. Well done to our Under 12 Boys who came home with the gold medals.